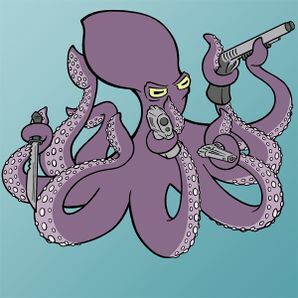 The Magnum Octopus (Enteroctopus magnum) is a boss-monster. Its a huge sea creature that participates in organised crime and carries eight magnum handguns of the type seen in the movie Dirty Hairy. Illegal in schools and government buildings, he hangs down from ceilings both looking to surprise enemies, and as part of his lovestruck quest to seek out and win the love of the Starbucks mermaid.